I knew it was going to be a good Los Cristianos Carnaval this year, dates were confirmed weeks in advance, posters were up and they even produced a nice colour leaflet. In Tenerife terms those are all minor miracles, publicity is not their strong point, health and safety is also a bit on the back burner with the handle hanging over and a young child reaching up for it. I watched the car park next to the Valdes Centre undergo its week long conversion to a showground complete with impressive stage, and the fair arrived on the other car park at the same time, both featured off cuts of wood, breeze blocks and lots of crossed fingers. 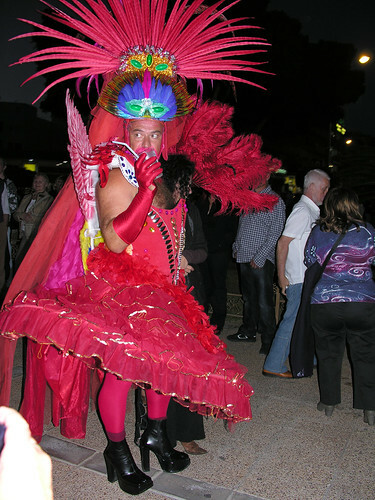 The Carnaval theme was the Circus so thrills and spills seemed about right. My first trip down was on Friday night for the election of the Carnaval Queen, it of course started alte so I had a wander around the busy, bustling fair and was as always transfixed by the bull stampede ride. Considering there is a recession on the plastic tat was selling well and many people had little plastic houses with a bored goldfish trapped inside. Lots of families were enjoying the preamble to the stage show and my word what a lot of yummy mummies there were. Eventually the stage cranked into life and amid a plume of smoke rearing white horses were propelled around the stage before acrobats and jugglers did their bit. With 6 royal candidates to come and no sign of the intros I retired to The Merry Monk across the road returning briefly later to check on progress, the Dorada won the war with my patience and I never saw the coronation. On to Sunday and the Coso, the big parade, I felt quite bad that I could only see the first half of CD Tenerifes away game on tv in a local bar, in the end I felt bad about having watched any of it. Duty called with my piece for Tenerife Magazine hanging in the balance and with blazing sunshine it was a pleasure to head down to Paloma Apartments to round up the usual suspects. Many of the young ladies were just adjusting their costumes; of course I didn’t peep. It was baking hot, drink lots of liquids they say, well that advice was being taken in many forms. The parade seemed longer than ever, so many people made an effort to put together floats and performing groups, there were liberal amounts of men in dresses and women nearly popping out of theirs and all to a vibrant musical beat. The new Carnaval Queen Khar Ndoye milked the applause as she travelled in her gilded cage under the chosen name Queen Of Africa, at least she didn’t have to dance, feet were pounding out to the drums and whistles, many of them in very challenging heels. It must have been a relief for the revellers as they turned into the side road at the end of the parade just as dusk was moving in, but the thousands watching, myself include, loved every minute. Monday brought the farewell act of Carnaval, the sardine funeral, my favourite, packed with bad taste and outrageous outfits it’s a gesture of defiance to the church from when they would preach abstainance for the people during lent while living the good life themselves, for the poor, sardines were plentiful from the sea and kept them going. 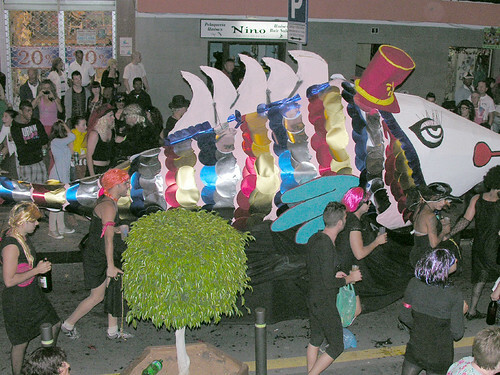 This years giant silver sardine was a particularly proud and perky specimin complete with pouting lips and a glint in the eye, the music was cranked up, the bottles tipped back and dresses lifted to display various wares and off we all headed towards the beach on a strung out back street route. The mourners are a key part of the fun and split their time between saluting the sardine and chanting its praises and rolling around on the floor weeping for the upcoming loss. After a few years of sardines so heavy that they could hardly be moved, the fish now rests its gills on a trolly so it can be propelled easily leaving more bodies free to gyrate, dance, and generally go wild. Down below at the old beachÂ many tourists had take the pre advertised timing at its word and were sat along the sea front promenade, I could see it would be a long journey so adjourned to The Devon Arms to raise a few Doradas to my fishy friend before cutting down to the beach just in time. As the dancers shepherded the sardine into the marked off area on the sand some rushed down to line the barricades while others kept to their vantage points that they had guarded for hours. Most of the mourners squeezed into the pen and danced around the doomed fish as fuel was sprinkled over it before the match was struck. Flames leapt out of the hollow belly and devoured the carefully crafted fins on its back, a few fireworks were sent skyward but the death wasn’t long and lingering. The glow of the fire on the now unrecognisable frame warmed my face, the dancing was set to continue here and at the showground for hours but I headed home via a bar stop just to make sure the smoke hadn’t dried out my throat. But as far as this years Carnaval goes I could see the end. Fifth CD Tenerife Defeat On The Trot,They Shoot Horses Don’t They? My eyes were witnessing the colour and passion of the Los Cristianos Carnaval parade but my ears were being fed the slow lingering death of CD Tenerife with the latest defeat, this time 1-0 at Elche. After watching the first half in town duty called for my Tenerife Magazine report, I’m told we played better in the second half and late red cards for Beranger and Ricardo were unlucky, sadly that just wont wash anymore we are plummeting towards an uncertain future in Segunda B and the studio talk on the radio was of another coaching change with either or bothÂ Marrero’s Martin and Christo coming in. Salamanca had sent an encouraging signal in the morning with a 5-0 home to Valladolid but other results meant a defeat would leave CDT seven points adrift of safety. So it had to be all out attack didn’t it? I couldn’t believe how slow, timid and deep we were early on, Prieto (above) and Luna were the centre back pairing after last weeks double red cards but Prieto’s first touch of the game was a clumsy tackle-welcome back. 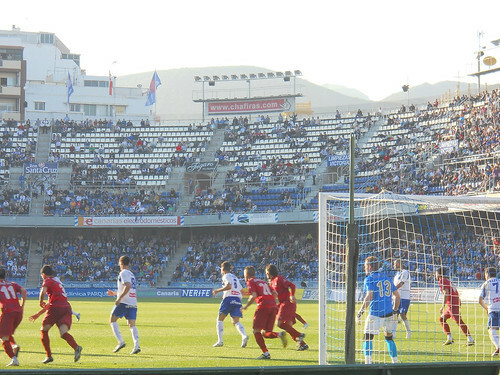 Elche were on top and from a corner after 16 minutes Mateo rose unchallenged to head the ball in the Tenerife net. Omar had a good chance to level when free on the left but fired his shot wide of the post. 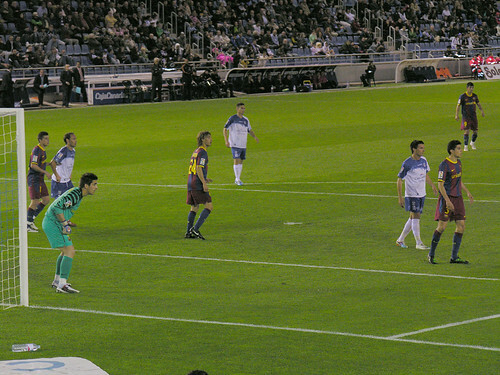 Carpio kept up the home pressure forcing a strong save from Sergio and then missing the target. Ricardo had probably the best chance of the half as Tenerife finished strongly but the home keeper Jaime pulled off a superb save. Natalio set up Hidalgo who couldn’t finish and Nino was unlucky just before the whistle for half time. The second half opened with a penalty claim by former Tenerife forward Angel after a Prieto tackle, thankfully the ref was not impressed. Nino was quick to pounce on a poor clearance by the goalie at the other end but failed to make the most of it. Angel in a good run of scoring form was keen to put one past his old team mates but hit his best chance straight at Sergio. Igor was brought on for Natalio and went close from a cross by an earlier sub Juanlu. Coach Tapia gambled bringing on Julio Alvarez forPrieto but there was no way back despite a late effort from Omar from just outside the area. There always seems room for a little more damage with Tenerife this season, Ricardo got his red card for a second booking in inury time and Beranger joined him a moment after with a straight red. The problems just keep mounting up as the games dwindle away, if the proposed players strike doesn’t close the league down next week Tenerife have to travel to relegation rivals Nastic with their latest red carders missing. AFTERMATH – Reports say that Ricardo and Julio Alvarez came to blows in the Tenerife dressing room after the game and security had to be called. Who needs Eastenders?. 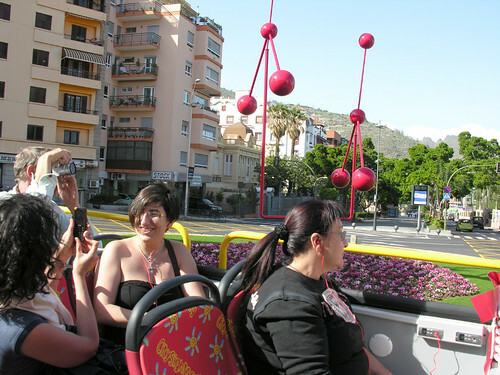 The fair may have moved on from the Tenerife capital Santa Cruz but there is a new white knuckle ride in town, the City Sightseeing tour bus or Guiri GuaGua as the locals refer to it. My friends Neal and Karen, the Bournemouth section of the Armada Sur may never forgive me for dragging them onto the first of 2 days of free trial rides on the bus to launch the new tourism service. Basically it’s a 40 minute round trip of points of interest in Santa Cruz with 11 stops. Aimed at visitors for a adult price of 9.99 euros (6 euros residents) you can hop on and off at any stop over a 24 hour period. The company operates similar buses in many countries including mainland Spain and it soon became clear on our trip that there was no local knowledge. We got on at Plaza de Espana, Neal and Karen downstairs to avoid more scorching sun and me and my camera upstairs with a sprinkling of multi national passengers. Plugging the licourice red free earphones in and selecting English from the 8 languages we were off into Avenida de Anaga and there were a few squeals as overhanging branches raked a few hair styles. The commentary seemed well informed but I pulled my plugs out, partly to let me move easier and partly because the twinkly classical music was cracking me up. At first I thought the constant blasts on car horns were just normal Canarian banter but the upstairs attendant was looking over the side with quite a bit of concern and as we circled Parque Garcia Sanabria for a third time I started to pay a little more attention to the road ahead. Avenida de Vienticinco de Julio, part of the scheduled route was tight, very tight, with more tree interferance on our upper deck and I was now aware of some angry shouting from the street below. My mobile rung and I was surprised to hear it was Karen “we’re lost and think we should get off quickly” made me check the route on the leaflet and look out from the bus to see the old bull ring looming up, yep we were well off course. Scrambling downstairs I had the gaps filled in for me, we had nearly knocked a resting pedestrian off a concrete roadside bollard and scraped the bus against another bollard. That had prompted a change of driver, with the original joining the 3 other staff in frantic gestering from the leaflet map to street signs and back again, they didn’t have a Scooby Doo. Earlier when I told my footie loving pals that the bus went by places of interest they suggested CD Tenerife’s stadium, I had laughed and reminded them it was way off course but now here we were turning into Avenida San Sebastian with the floodlights of our place of worship just ahead of us. We managed a quick wave as we passed our matchday bar just down the hill from Soccer HQ. Blimey what an adventure, I had started out feeling like Cliff Richard in Summer Holiday and now I fellt like Keanu Reeves in Speed. By now even the mainly tourists upstairs had twigged that all was not going to plan and several had filed downstairs hoping to escape the Magical Mystery Tour. As we headed out of town and then looped back along the sea front by the Auditorium an hour had passed so we belted out an S.O.S on the bell and got off outside El Corte Ingles, we didn’t want to riskÂ heading back to Plaza de Espana. 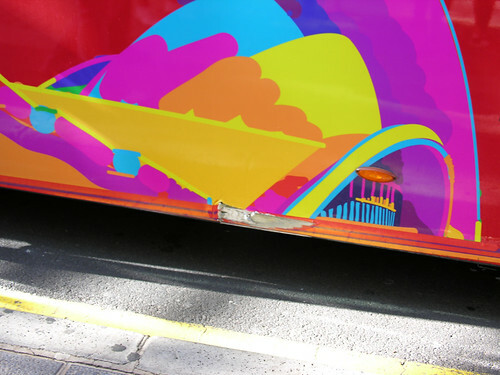 I clocked the damaged paint work as I got off, not bad for the first day, there are actually 5 buses working the route so maybe they will soon all have matching chips. A bit of forward planning would have served the bus company well, surely they should do “the knowledge” and find out about traffic priorities and where they are supposed to be going. Only this morning there was a photo in the local paper of another car tapping on the door of a tram with its front bumper, now we can add tour buses to the equation. Of course the tour buses will learn to fit in and the taxi drivers will warm to them and greet them with polite phrases and dainty finger gestures. Look out for the big red monsters in the capital, you can get all the info about routes, service etc at their website. For me it’s another tale to tell of life in Santa Cruz – just when I thought I had seen everything. As the referee blew the whistle for full time I quite expected some fans to turn on the CD Tenerife team for their inept 2-1 surrender to Cordoba but there was a feeling of numbness and the awful realisation that relegation could now be a reality. The talk after the game wasn’t about how we can claw our way out of this mess but more about what teams we will play in Segunda B and which, if any, players are worth keeping at the end of season. There are 12 games left and CDT are 4 points from safety so escape is possible but the players, Nino apart, need to find some balls and some heart. There were pre game boosts with Nino’s yellow card at Numancia recinded and Sergio reporting fit after his head wound in the same game, on the down side Julio Alvarez pulled out on match day with a muscle strain. Igor started up front with Nino and hit the post in the first minute, Sergio Aragoneses fumbled a save and gave Diaz a reat chance but he blasted wide. Cordoba looked very poor and Tenerife grabbed the initiative after 13 minutes, Dubardier sent in a tantalising cross from the left and Nino met the ball with a great header to make it 1-0. That was the good stuff but it soon degenerated into gloom, the home side were playing far too deep, Omar looked like an extra full back and worse was to come as Bertran continued his poor form with a stupid tackle that gave Cordoba a free kick. Callejon stroked the ball up and past Sergio to level at 1-1. This was the time to show character but it was nowhere to be seen, maybe in the scorching sun the half time pitch watering would put the skids under Cordoba – sadly no. Melli got himself involved in a tussle with Diaz 5 minutes into the second half and dragging him back he earned a red card, that left the home defence in a right pickle, they were still adjusting when Alberto made the most of a break to plunder a second goal for Cordoba. The rest of the game was a slow torture, Natalio and Juanlu Hens came on for Hidalgo and Igor but it made little difference. Nino carried the fight to Cordoba with little help, he was unlucky to see his shot trickle wide of the post as Natalio steamed in and when he laid the ball back to Ricardo the third sub blasted his shot high. Cordoba couldn’t believe their luck, a win would pull them away from the fringes of the relegation zone, they were determined to hang on and didn’t care how they did it, diving and theatrical rolling around all won favour with the weak ref. 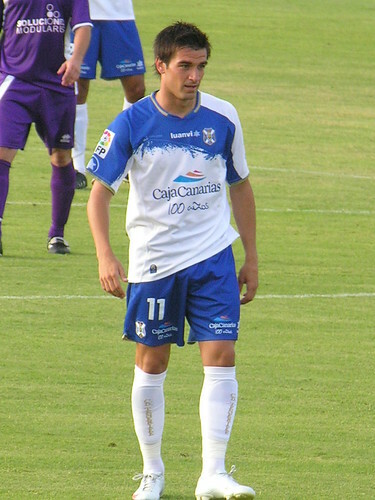 As the game ticked into injury time Pablo Sicilia got a second yellow card and became the ninth red card of the season for Tenerife. Things could get worse, the scoreboard flashed a 1-0 away win for Las Palmas at Albacete. Depressed? you bet I am, a lot of the players just don’t seem to care and Bertran should be relieved of the captaincy, he doesn’t lead by example and doesn’t motivate his team mates. With 2 away games coming up I’m hoping for a miracle, is that too much to ask? There are some news stories in Tenerife that keep coming around every few years like Haleys Comet, one of these old chestnuts is the future of Los Tarajales beach. For those not familiar with the name, it’s the scruffy undeveloped stretch heading out towards the Sunday market and Arona Gran Hotel. 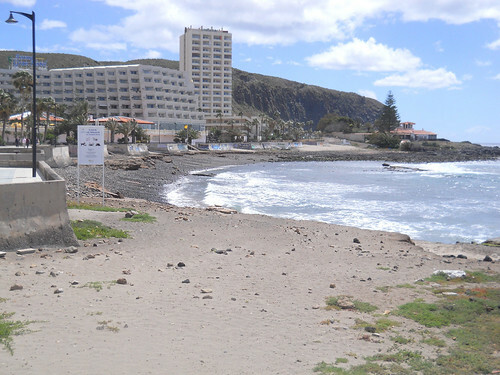 I was surprised to read that the Los Cristianos neighbours association are pressing Arona council for some definate plans to redevelop the area and the coast back towards the ferry port. Isn’t this the same area that had plans drawn up 3 years ago and later had tons of sand dumped on the uncleared and unlevelled beach? Sure is, and as most people predicted the sand washed away and that was about it till the next lot of promises. 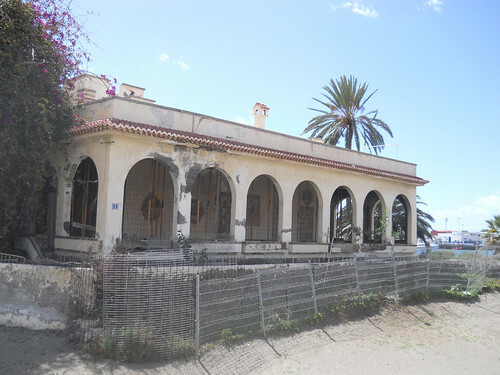 The neighbours probably feel it’s a good time to ask for action as the council elections are held in May, as well as the beach being improved they want the old crumbling house on the beach (below)Â restored as part museum and part restaurant, sounds good to me. The whole stretch was due for demolition at one stage but recently the white Cristian Mar apartment block was given a facelift and new concrete supports installed so they obviously have long term plans. Back at Los Tarajales beach there is some new graffiti, a few of the modern unused locales have now got bars in, and the manky wild cats are still roaming wild and planning a Broadway musical. Never mind, look out for my next update on the area in about 4 years time. 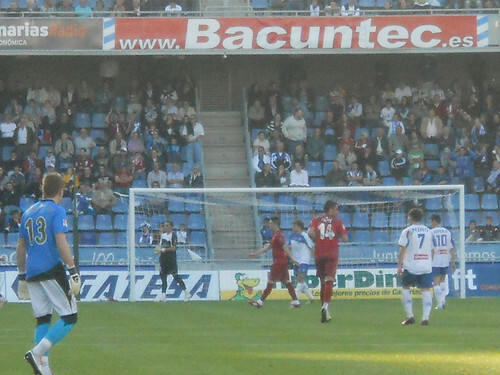 Lack of consistency is one of the most annoying traits in a referee, Molero Lopez gave a penalty against CD Tenerife for a dubious hand ball and ignored a stronger claim in their favour in the dying moments of this 2-1 defeat at Numancia. When the anger has subsided it’s difficult to ignore the fact that Tenerife’s shooting in front of goal was woeful and a third straight defeat has left us in deep relegation danger. Natalio was preferred in a supporting strike role to the large and lumbering Igor and he fired wide in the opening minutes. Early play was scrappy but the ref made his presence felt, after 14 minutes Kitoko was called for a harmless tackle and although Sergio fussed over the placing of the defensive wall Bakero’s free kick curled between them and into the net for an early lead. 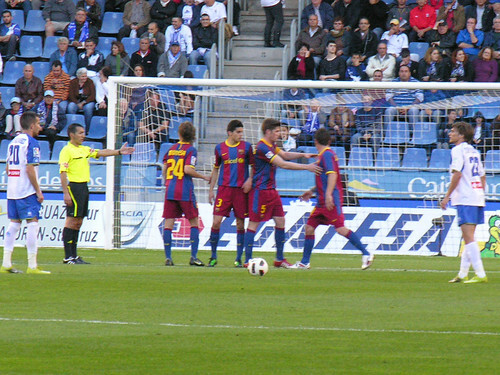 Neither side was shining but Tenerife got a lucky break when Nagore under no real pressure headed into his own net when trying to nod a cross over his goalie’s crossbar.Nino had looked quiet in the first half but a few minutes after the break he forced La Fuente to tip the ball away for a corner. 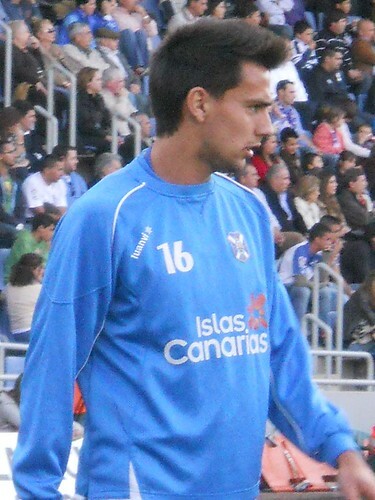 Igor had come on just after half time and gave Tenerife a target to aim for but it was the home side that grabbed a goal. Cedric broke down the left and put a cross in from the byline, Kitoko had no chance to pull his hand away before it hit him and the ref pointed straight to the penalty spot, Bakero sent Sergio the wrong way and restored the home lead. The rest of the game was dominated by Tenerife but it’s all about goals and their finishing let them down time and again. Natalio was the main culprit although he was unlucky to see his acute angle shot nutmeg the keeper but ping back out off the post, his next effort was skied over the bar after Igor had chested the ball down for him. Omar still hasn’t scored a goal for Tenerife and should have broken his duck after turning in the box and screwing his shot wide. Sergio had already made 2 strong saves at the other end but after spilling a catch he went to reclaim the ball and took a stud in the head from an incoming Numancia player who was making a legitimate challenge. The gash just above the eye was a mess and he will have a nasty scar as a reminder of his day out on the mainland. That challenge didn’t hurt half as much as the referees final act in stoppage time, a through ball was heading for well placed Nino in the penalty area when former Tenerife defender Culebras deflected it with his hand, a clear spot kick but the ref didn’t want to know and blew for time soon after. Even after the game things got worse, Las Palmas won 2-0 at home and jumped over CDT in the relegation zone. Tough times indeed. With a slap of a hand, or the cut of a ribbon, the new Los Cristianos auditorium will make its debut on the musical stage tonight. 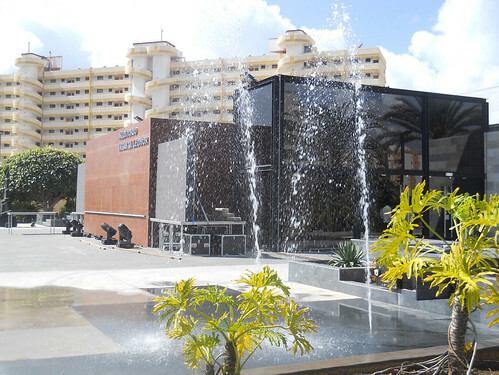 Auditorio Infanta Leonor is the new pride of Arona and will provide a great new venue in the south of Tenerife for music and performance. Infant Leonor is the 5 year old daughter of Prince Felipe and Princess Letizia of Spain and judging by the huge speakers being put in place outside today she will arrive in good voice. 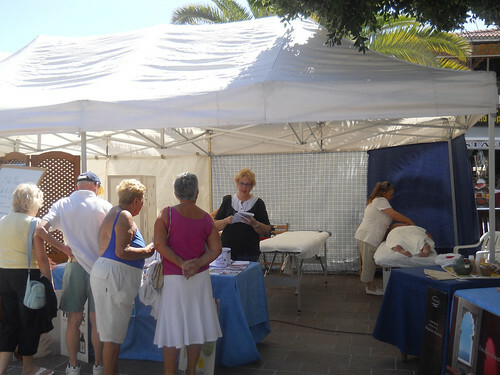 The new centre is at the back of the cultural centre in the heart of Los Cristianos and was a scene of frantic activity today as last minute preperations were made for the 8pm civic opening. The gruas were moving parked cars from the nearby area, the concourse was being swept and the water features turned on so they could trickle through the rock gardens. 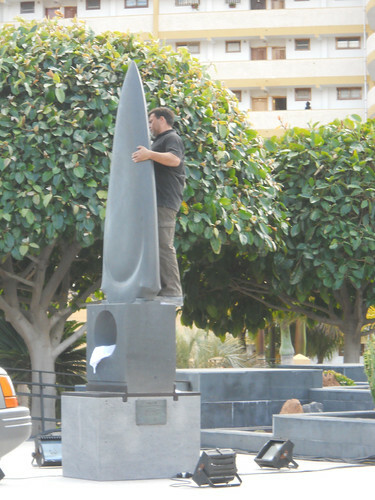 There is a large statue, donated by the Valdes family, waiting to be unveiled tonight, it’s sculpted by Fernando Mena who made Cetaceos, the popular whale tail display down by the front on the old beach of Los Cristianos. when I went by earlier the cover was off and a workman was polishing what looks like a huge shark tooth. A large lighting and sound rig will ensure that the overflow from tonights opening concert can be heard probably as far away as La Gomera. Among tonights artisitic delights are the Trio Candelaria, comprising of soprano, guitar and piano, and the Tenerife Ballet. There is a stage with open air seating area upstairs in the cultural centre but it is very small and the lack of cover leaves it at the mercy of the elements, the new arrival should attract many more cultural gems to this busy tourist area. Once I get a calendar of forthcoming events I will be shouting them from the rooftops. 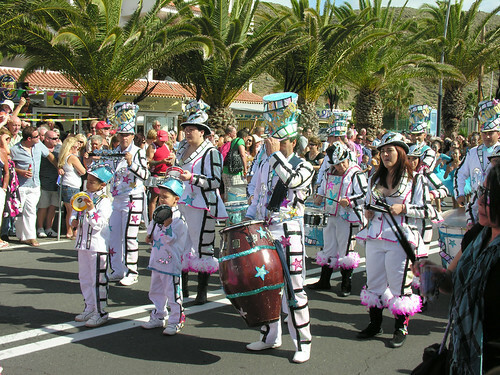 Carnaval season is well underway, today was the big parade in Santa Cruz and today was also a holiday, the schools have even got the week off so that hungover parents don’t have to get up early. 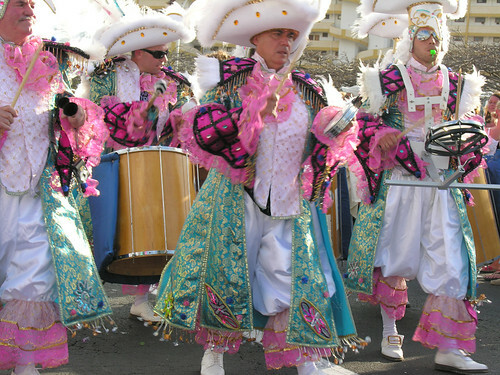 After sacrificing several small animals in an attempt to ward off any future defeats for CD Tenerife, I headed down into Los Cristianos, yep definately Carnaval season, a troup of musicians were gathering with their large bongo drums outside the Apolo centre ready to head up to Santa Cruz. 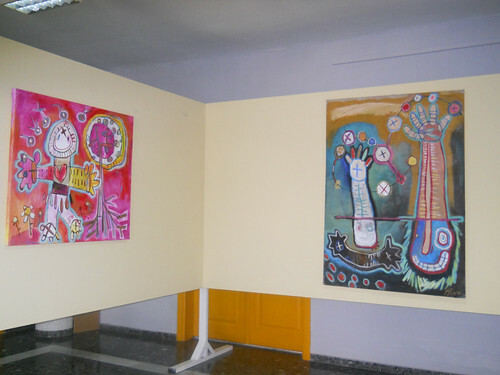 Todays holiday was only loosely observed down south so I made my daily call at the Los Cristianos cultural centre where a new exhibition of Carnaval paintings were on display. The works by Javier Isidoro Aixa, a local wind surfer, are delightfully surreal and captures the sense of fun surrounding the annual celebrations, there’s no charge to feast your eyes on the small gallery, they always have at least one art exhibition going on. The paintings await you until 31 March and you can pop in weekdays from 8am to 10 pm and Saturdays from 9am to 1 pm. It was of course Shrove Tuesday so naturally I wanted a shrove, failing that I settled for a pancake. One of my regular haunts is Via Vai on the old beach front and they do a very nice Quita Penas (no worries) rum and raisin ice cream and vanilla with a nice sized pancake, very yummy. The wind was up a bit today but thankfully no sign of the heavy rain from up north last night. Heading along the front I noticed a small tent by the Plaza del Pescadora and popped over to have a nose. The other claim to fame for today was International Womens Day and Arona council were doing their bit with a free drop in centre, shame it wasn’t publicised in advance. A small seated area was set up not far from the fisherwomans statue for promised talks and advice but in the tent there were free massages. Two volunteers were being neaded like some fresh dough and several others were hovering around for their turn, much better than being ripped off by the illegal oriental girls on the beach. The special area was open from 10 am to 10 pm today, you never know what you will find during a stroll along the front. Way back on 28 November was the last time CD Tenerife kept a clean sheet and Monday night visitors Barcelona B had racked up 10 goals in the last 2 games, it was going to be a tough one. A look at the morning papers had further worrying news, Nino was an injury doubt, he was cleared late in the day and took the captains armband from Marc Bertran who failed to recover in time. Despite those portents of gloom the Armada Sur were well up for it as our 2 packed coaches arrived in the capital. 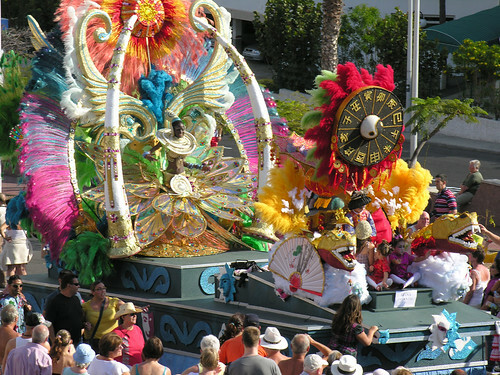 Carnaval was weaving its spell and the passing fans put on a good show with their imaginative costumes. Coach Tapia made a bad move putting Juanlu Hens at right back and he was soon shown up by Barcelonas flying forwards, Soriano gave him a nice all over roasting. Luna was too slow to pick up Oriol after 10 minutes and Sergio had to come to the rescue with a timely save for a corner and then another from Santos straight after. Juanlu looked slower than the “fat ladies” on the Grada Popular Alto as he lost the ball but at least he recovered to spare his blushes. Nino had a great chance a few minutes later but failed to make it count, Barcelona were settling in and Roberto laid on an inviting pass to Oriol to open the scoring after 22 minutes. Barcelona were stroking the ball about, their mainly young side showing great composure and confidence so it was no surprise to see Nolito crack in a fierce shot from the edge of the area to make it 2-0 just before half time. The black clouds were gathering over Santa Cruz as the second half kicked off, Omar came on for Pablo Sicila with Kikoto dropping to centre back. The coach’s tactical gamble was understandable, KikotoÂ is a great ball winner, but it robbed the midfield of the little bit of steel that they had. Big striker Igor made his home debut after 64 minutes and gave Tenerife some much needed prescence up front alongside Nino. Igor was giving the Barcelona defence some new problems in the air which made it seem wasteful when Omar sent a rare corner in along the ground. The referee had forgotten his clown costume but his decisions gave him away, Nino was assaulted by a high flying Barcelona boot with no punishment given. The ref had no trouble finding a second yellow for Dubarbier after 74 minutes leaving CDT with 10 men. The home defence lost their footing and concentration as the heavens opened and poured industrial quantities of rain on players and fans. Nolito latched onto a counter attack and hit his shot against a post, bizarely it bounced out against Sergio’s back and into the net. As players looked forward to getting dry, fans on the terraces soaked up the rain singing and dancing in their lovingly made costumes. Nolito had plenty of room to complete his hat trick with 10 minutes left but that didn’t stop the Carnaval singing from the hardy faithful in the 17,587 crowd. Igor showed that he can play a part in the survival struggle as he used his height to set up Nino to pull back a late goal. Barcelona were very impressive and look set to fill one of the promotion places that they can’t accept due to the senior teams status. If only we had pots of money to tempt away some of their bright nuggets, but we don’t, it’s going to be down to grit, hard work andÂ character. 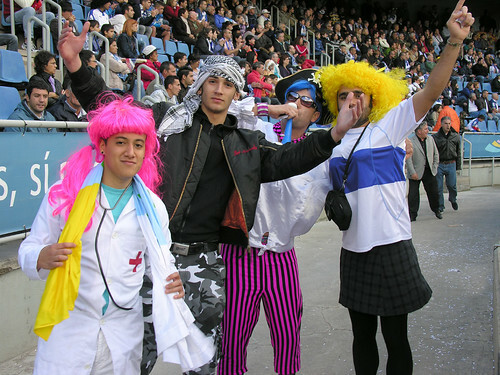 At least the club know that the fans are serious about their football, although you might find that hard to believe looking at the way they dress. 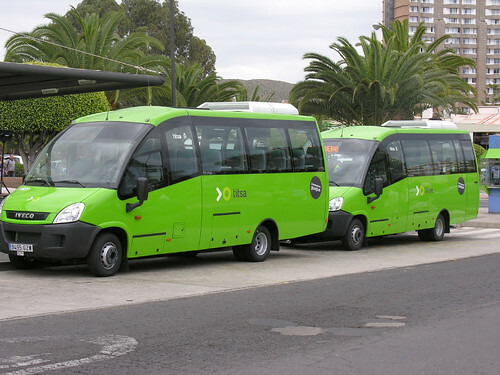 There was a momentous event at Los Cristianos bus station on Thursday as a crowd of dignitaries gathered, not just the fact they didn’t get their pockets picked but also the arrival of 2 new micro buses, ready to improve their excellent services. 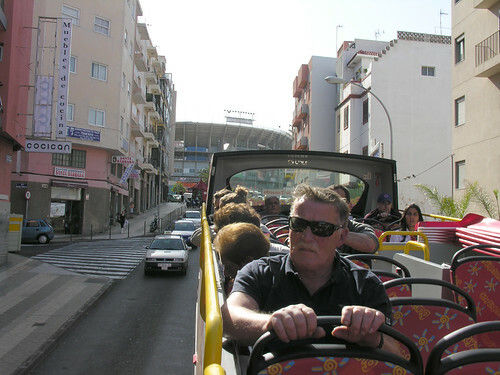 Regular readers will know that I’m a big fan of Tenerife’s public bus service, I’ve got a bono ticket in my pocket and I’m not afraid to use it. For the technically minded the 2 newcomers are 27 seaters and state of the art with all mod cons and of course zero emissions – except when I get on after a curry. 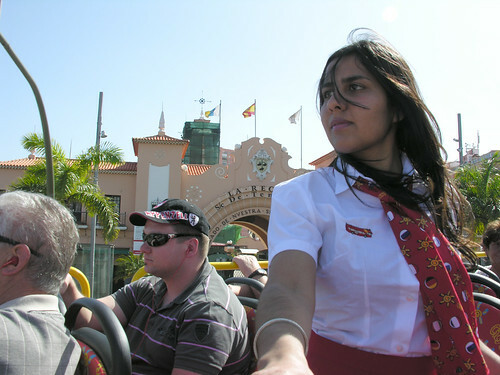 One bus will see service on the 468 route that came in last year running a circular service linking Parque La Reina, Las Galletas and Palm Mar. Theses buses will now run more often and take in extra rural stops at Las Rosas, Guargacho, Orotianda, Guaza, El Fraile, Costa del Silencio and La Canada. The other bus is specially adapted for those with limited mobility and will run on the 110 direct route to Santa Cruz. 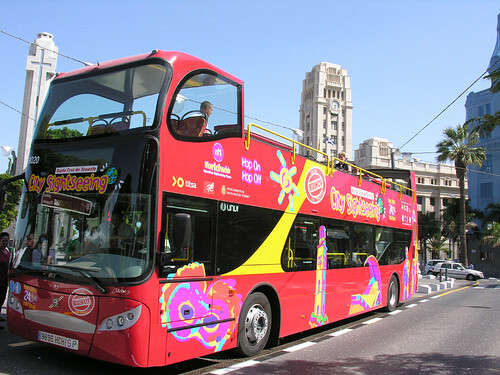 And talking of Santa Cruz, the 110 will now run on weekends and fiestas giving a speedy alternative to the 111 Santa cruz to Playa de las Americas. For full listings pick up a new booklet timetable, the old fold out map versions have been overtaken by subtle tweaks to timings on many routes. Otherwise you could check out the new improved website which gives you several ways to track your bus via your phone. I mentioned the pick pocket plague before, plain clothes police at Los Cristianos have made a big impact, please still be careful, but on a trip up west on Friday I heard several reports oif our light fingered friends doing their Fagin impression around Los Gigantes. Happy travelling and Keep Em Peeled as Shaw Taylor (ask your Gran) would say.